OCEAN BEACH, CA. 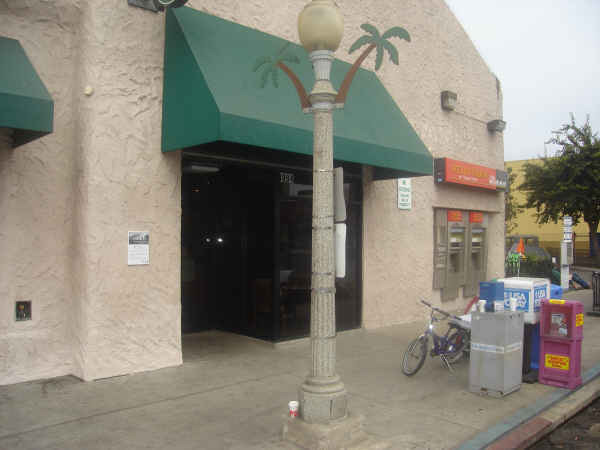 The original OB Rag – that iconic Ocean Beach underground newspaper – and our blog’s namesake-, received an honorable mention in a plaque fastened to the side of the old Bank of Italy building recently. That building, on the northeast corner of Newport and Bacon, has been many things over the years. Today a corporate coffee shop, an ATM, and a hairstyler is in the building; but yesteryear it was the Bank of Italy. During the Depression, in order to show a more patriotic luster, the Bank of Italy changed to … the Bank of America. Then during the early and mid-seventies, the building became vacant. In 1973 the staff of the OB Rag joined a group effort to lease the entire building. The Rag had an office in the upstairs loft, while a bookstore and a crafts co-op took over the bottom. There was also a large space for community meetings, events, and presentations. 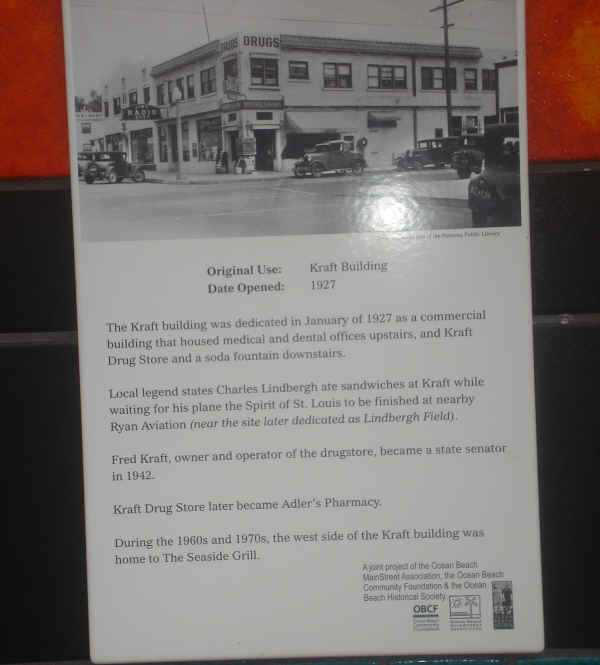 The building was renamed the Left Bank. Later the building became a famous coffee house. A couple of famous artists had their beginnings there. At any rate, a bunch of OB organizations decided to memorialize a number of old buildings, and the old Bank of Italy/ Left Bank was one of them. The OB Historical Society, the OB Mainstreet Association, and the OB Community Foundation organized this plaque and the others. 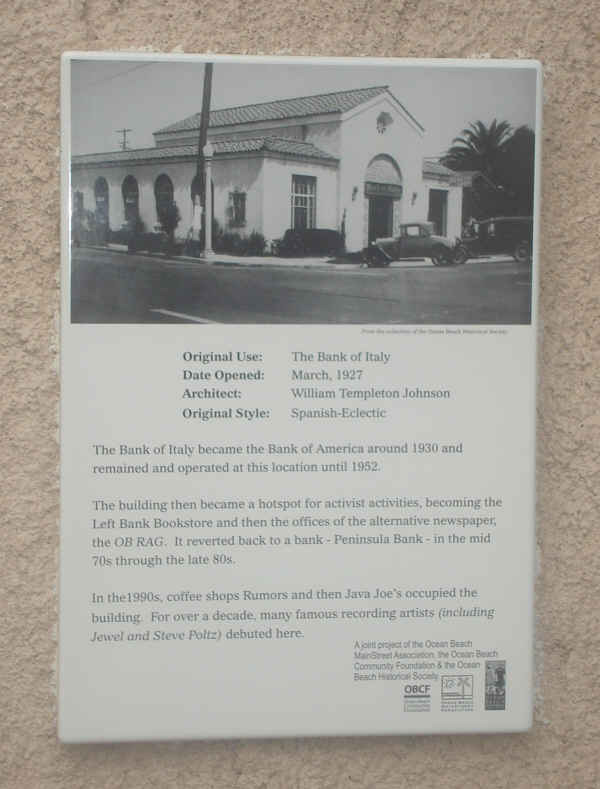 The Bank of Italy became the Bank of America around 1930. The Bank remained and operated in this location until 1952. The building then became a hodgepodge for activist activities, becoming the Left Bank Bookstore and then the offices of the alternative newspaper the OB Rag. It reverted back to a bank – Peninsula Bank – in the mid 70s through the late 80s. In the 1990s, coffee shops Rumors and then Java Joes occupied the building. For over a decade, many famous recording artists (including Jewel and Steve Poltz) debuted here. Other plaques were placed at the pier pump house for the Silver Spray and Camp Comfort, The Kraft building, Strand Theater, Newport Hotel, the OB library and OB Elementary. Well they should obviously make space available again for the OBrag, don’t you think? I’ve been seeing these plaques around our town and really appreciate the effort that everyone involved has put into them. Many thanks for focusing on our history and heritage! Thanks to OB Historical Society and all involved in the very interesting plaques.